Cast-iron furniture was integrated into domestic interiors early on in the 19th Century with the work of the Bullock Brothers and Karl Friedrich Schinkel. It was after the period of sober neoclassicism of the first half of the 19th Century that the exuberance and movement of the rococo forms regained popularity. Cast-iron was a natural medium for fashioning the sinuous scrolling forms of the Rococo because of the malleable character of molten iron. The form of this table is typical of the George II style as exemplified by the designs of William Jones, Batty Langley and Matthias Lock. Yates' firm at Effingham Works, Rotherham, having merged with J.Haywood and Co., received considerable praise for their work at the Great Exhibition of 1851 in Hyde Park. The Art Journal Illustrated catalogue, 1851, page 205. 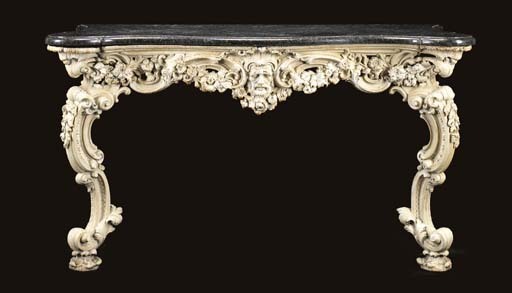 A side table of similar design, with the same C-scroll cabriole legs and central mask, was sold Christie's at Wrotham Park, 22nd May 1990 lot 256. A related side table by Yates, Haywood & Co., is illustrated H. Himmelheber, Cast-Iron Furniture: And All Other Forms of Iron Furniture, Munich, 1996, pl 228. Please note the description should read: with a later gray granite top and NOT with the original white marble top as stated in the catalogue.